Fairy tales are generally written for children, but there are often very dark and scary parts that might actually upset kids more than delight them. Especially frightening are the stories of the Brothers Grimm. The Box Theatre Co. has taken a bunch of those often grim stories and turned them on their head in the premiere presentation of “Molly’s Mostly Accurate Retelling of Fairytales,” written by Deanna Strasse, a Milwaukee resident. Original shows are so difficult to produce since it’s hard to know what will work on stage until you get there. In this case, it’s all kids. But the result is quite delightful with this group of kids – directed by Allison Chicorel and Timothy Barnes – embracing all the silliness with youthful fervor. 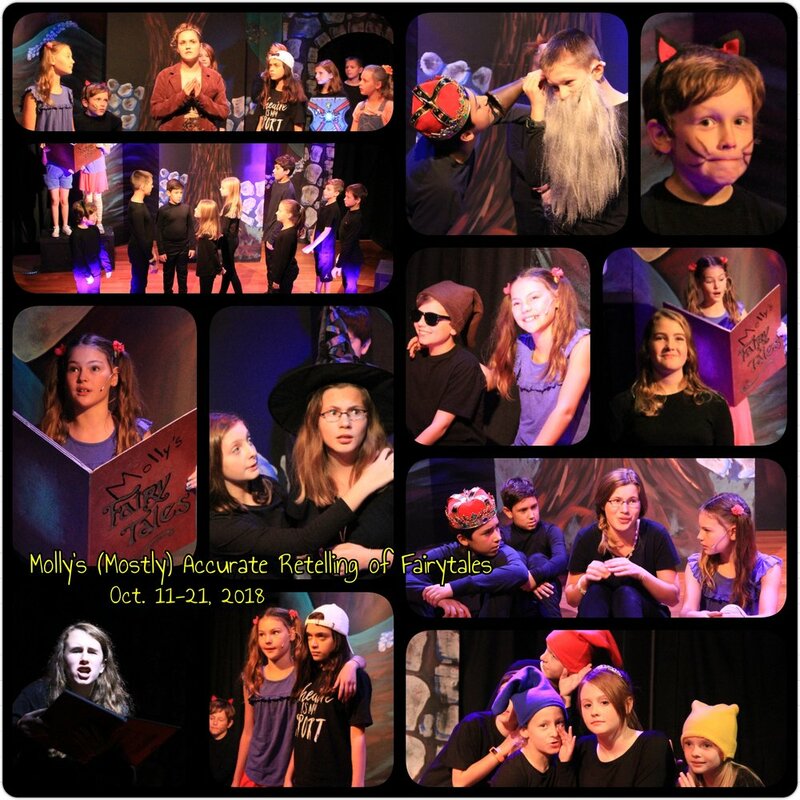 In the show a troupe of youngsters is putting on a series of plays based on Grimm’s Fairy Tales, but there seems to be a disagreement as to how they should be presented. The troupe’s president, Kris (Ivy Broder), wants the stories to be faithful to the originals, while the rest of the troupe seems to think they could use some tweaking, perhaps updating, to make them more accessible to today’s audiences. Kris is adamant that they be “completely accurate or not accurate at all,” dismissing the “mostly accurate” retelling that the show’s narrator, Molly (Maya Kalush), prefers. Later, Peaches (Natalie Krogwold) joins Molly in reading from the big book of altered fairy tales. These updated versions feature references to Wi-fi, a lost dental retainer, a sheep hoping to open an aromatherapy business and a horse hoping to go to law school. The kids dance to “Happy” and cavort in all sorts of ways the Grimm Brothers never dreamed of. There are surprises around every corner and the kids deliver the comedy well. Most of the cast take on multiple roles, certainly giving them some solid training in the art of quick costume and scene changes. The first act starts with “Rumpelstiltskin.” In this version Mr. Grimm (Logan Franke) loses his daughter, Sally (Olivia Hagedorn), on a bet with the Prince (William Kastner), who threatens to throw her in prison if she can’t weave straw into gold. Sally is saved by a mysterious character named Rumpelstiltskin (Keegan Vrbetic), who just happens to have a bag of gold. Kris comes back at the end of the skit, raving about the brother ravens. The original has them turning back into humans. But not in this one: mom and dad find their seven raven sons in a sack. Molly gets into it with Kris, telling her, “What a black and white life you lead,” referring to Kris’s inability to think outside the box. “Snow White and the Seven Dwarfs” contains some very funny bits, starting with Snow White’s mother, the Evil Queen (Delaney Cowles), who is sort of dying. Hagedorn as Snow has an understated coolness about her while she and Cowles milk the scene for lots of laughs. Cowles does a nice job with the mirror scene, in which she plays both the Evil Queen and the Mirror. When she learns she’s not the fairest, she sends a servant to kill Snow, who ends up in the woods with the Seven Dwarfs, all named after body parts, including Pancreas and Elbow. After being told that the parts total up to an awesome whole, Snow joins them, taking on the name Heart. To open Act 2, Lydia (Eloise Slipper) reads exuberantly from “Beowulf,” to the delight of an audience member who shouts her approval. It turns out to be Kris. Maria (Julia Rady), the stage manager, spots the imposter and exposes her onstage. “I am not silly. I have respect for tradition,” Kris explains. She agrees to a continuance after being told she can play Hans the Hedgehog. The scene ends with Cora (Cowles) reluctance to appear in her role since the black box theater is making her claustrophobic. Cowles conveys all the tics and facial gestures befitting her paranoid character. In “The Frog Prince” Kris again rants about the lack of a frog and a prince – but there is a charming talking horse (Rhodes) and it’s not Mr. Ed. Kris finally gets to shine in the final bit as Hans the Hedgehog, appearing first with a bagpipe, later bouncing onto the stage, beaming that he’s been accepted into college to become a pig farmer. Chicorel and Barnes once again have their charges well prepared for their many characters and scene changes. It is a fast moving 90-minute show, including a 15-minute intermission. Lots of fun and cute bits here, including Liam Eddy as the meowing kitten named Kevin, Julia Rady as the constantly frustrated stage manager and Broder as Kris, the fairy tale purist. Broder has loads of expression and handles herself well against her troupe opposition. Kastner is featured several times as a Prince and takes on those roles with a royal, confident air. Kalush and Krogwold have tons of lines as narrators and did well last Thursday, but could have spoken a little slower so audience members could understand all the wit. Other cast members include Noah Clark, Reagan Russ, Caeden Whelan, Ellie Wilhelm and Mikenna Fish.